The US Department of Homeland Security (DHS) has contracted Florida yard Gulfstream Shipbuilding to produce a monohull passenger/vehicle carrier – described as being a cross between a small ferry and a workboat – to work on behalf of the DHS’ Plum Island Animal Disease Center. The vessel will transport specialists, equipment, freight and vehicles (including fire engines) in the waters surrounding Eastern Long Island Sound, between New York and Connecticut, and Gardiner’s Bay, New York. 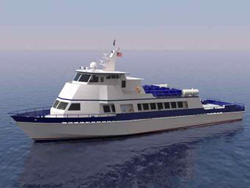 Designed by Louisiana-based naval architect C. Fly Marine Services, the 36m x 8.2m ‘work-ferry’ will feature a depth of 3.3m, a draught of 1.98m and the capacity to carry up to 148 passengers and crew. Her tanks will carry 43,188litres of fuel and 3,637litres of fresh water. An ice-strengthened hull is intended to ensure operability throughout harsh US East Coast winter conditions, and the vessel will conform to US Coast Guard (USCG) Subchapter T requirements for vessels under 100gt. The vessel has been accorded a quad-screw arrangement, with four Caterpillar C32 main diesels, rated 969kW apiece, turning four-bladed propellers via ZF 3050A gears. Additionally, a Wesmar hydraulic dual prop thruster, rated 56kw, has been supplied for enhanced manoeuvrability, while onboard power is supplied courtesy of two John Deere GK4045 gensets, rated 65kW apiece. Delivery is scheduled for April 2017.